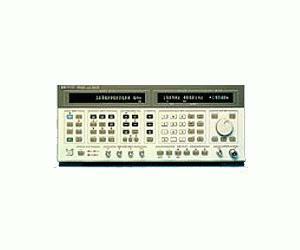 The Agilent 8665B signal generator is suited for basic receiver testing up to 6 GHz. With Option 004 (low-noise enhancement), it can be used for out-of-channel receiver testing or as a clock source where having the lowest phase jitter is important. Radar testing can be done by adding Option 008 (pulse modulation) . Pulse width and delay can be internally adjusted between 50 ns and 999 ns, eliminating the need for an external pulse generator. Standard FM rates of up to 2 MHz and deviations to 20 MHz are suitable for many applications such as high-speed digital communications. The internal modulation source generates sine, square, triangle or sawtooth waveforms. For applications demanding the lowest RF leakage, Option 010 provides increased RF shielding.